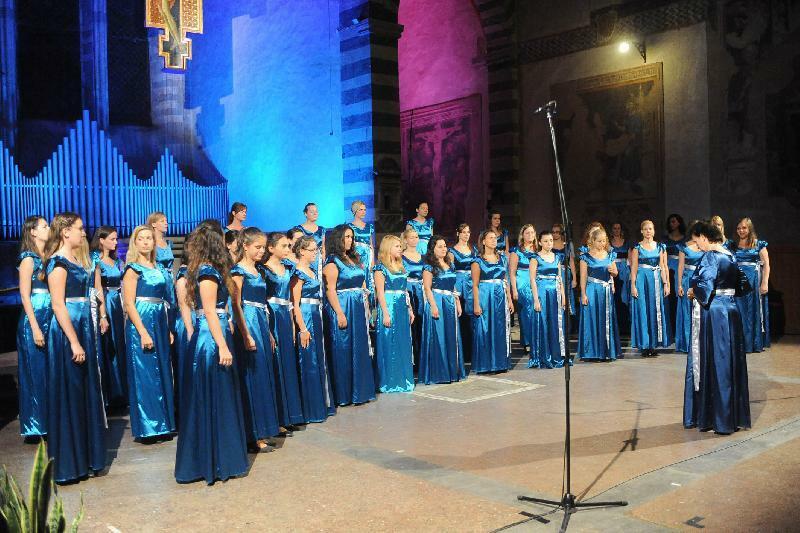 From 1952, the Association “Amici della Musica” of Arezzo started the International Polyphonic Competition. 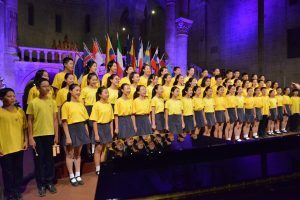 It’s the most important stage for choral expressions from all over the world: you can find an incomparable range of pieces, with different styles, by different authors. 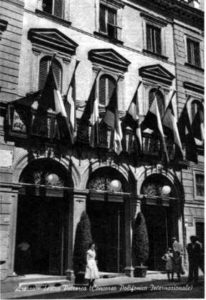 The newborn Association “Amici della Musica” (it was just founded under the “Accademia Petrarca”’s wishes: dated 14th of Genuary 1950) managed to organise a competition that that year was kept on a national level (it took place the 7th – 8th – 9th of September). The success, was more than flattering and founders’ fantasy was stimulated by it (chosen professionals led by a young magistrate with passion for music: the Dott. Mario Bucciolotti, with honorary members of the calibre of M° Arturo Benedetti Michelangeli, of Prof. Francesco Severi and the newly deceased Father Virgilio Guidi). The artistic Director, of the event, was one of the greatest musicians and musical organiser of those years: Luigi Colacchi, who was assisted by Augusto Cartoni and from a group of valuable Arezzo’s musicians (among which, there was Bruto Tignani, German school violinist and headmaster of the Music School of Patricino). 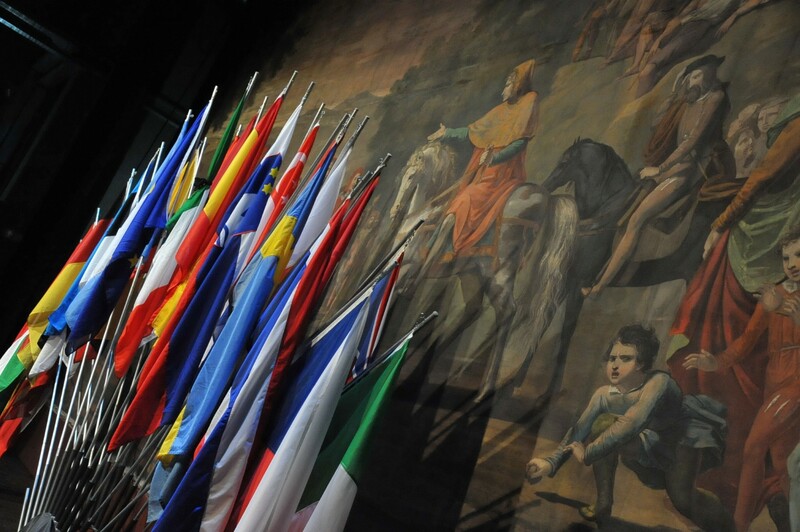 That is why the second edition (1953) was already international, with the presence of 6 nations in Arezzo. The days dedicated to the competition from 3 became 5, and instead of September, the event was anticipated in June (from the 25th to the 29th). Dante Alighieri said “Poca favilla gran fiamma seconda” (= “after a little spark there is a big flame”): the 1954 edition made permanent the internationality of the competition, even if the participant nations were only three (Switzerland, Austria and Yugoslavia). Anyway the month of August was tested and was considered so optimal to remain definitive until 2010 and being restored from the edition of 2012, after a short period in which the event was made during September, month that was revealed to be inappropriate for multiple reasons. 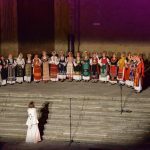 The Polyphonic has marked Arezzo’s culture and costume with grace and harmony: Berlin Wall was destroyed during the early 70’ with East and West German choirs that sang fraternally and carelessly of ideological barriers. Even a Republic President , came to Arezzo for the decennial, in 1962: Antonio Segni, the only head of State how ever came to the Arezzo’s event. 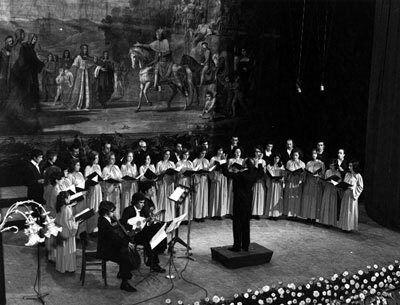 The years of Polyphonic have marked slow, but important improvements of Italian polyphony, which ended to win prizes: in 1967 the Choral “Coradini” (fresh of foundation, from the first months of the same year!) won the Competition “Cori Virili” with the direction of the Maestro Fosco Corti, destined to become one of the unforgettable Choral Kermesse’s figure and to leave a gaping hole with his untimely death. 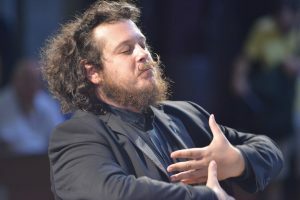 The organisers asked for the Republic President’s high patronage, Giovanni Gronchi, and they obtained it without any difficulty: proof of the prestige that the event had reached. A prestige recognised on Europe level from the event of the 1955, 4th of the Foundation and 3rd of the International Competition. 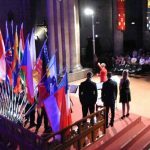 The nations that participated were seven: Austria, West Germany, Spain, Switzerland, Yugoslavia, France and, obviously, Italy). The organisation was excellent under every aspect and the jury was composed by some of the best name of European Chorus (Hans Haug, Hans Gillesberger ) and of Italian Chorus, from Alfredo Bonaccorsi to Celestino Eccher; from Lino Liviabella to Achille Schinelli (a name that in choral music correspond to Dante Alighieri in Italian schools); from Bonaventura Somma to Luigi Toffolo, a musician like Mario Peragallo. Others great names were: Nino Antonellini ( who replaced Colacicchi for the direction of the competition) and Franco Abbiati. It is interesting that from the beginning of the competition there was the presence of W.S. 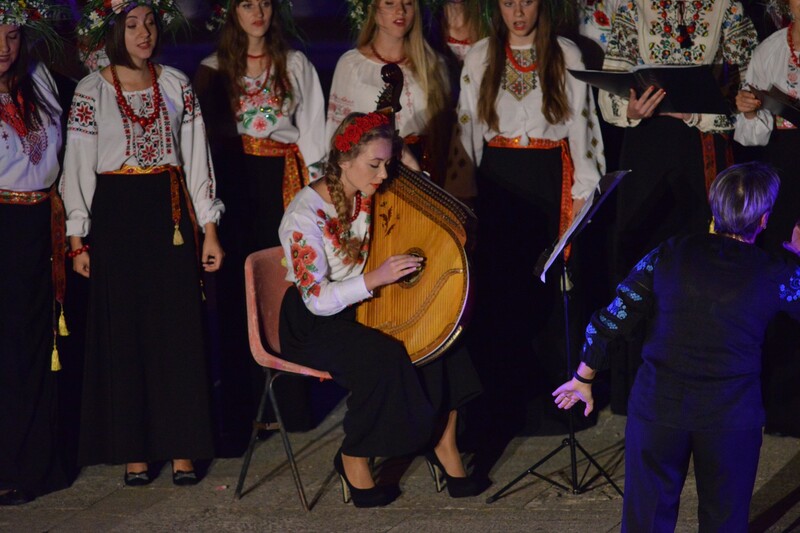 Gwynn Williams, artistic director of the Choral Festival of Llangollen, sign that they were already looking to Europe and to the World. Finally the political world and the big media realised the value that the aretina manifestation could have been for the growth of the cultural life of the country. With the title “Voices from all over the World in Arezzo”, the Incom Week dedicated a short but effective service to this 3rd edition: It was one of the first time that Arezzo was the object of nationals chronicles not because of the politics, or because of the art, or because of the literature, but only for a musical reason, related to his most distinguished son: the monk Guido! In the footage, during the inauguration of the Competition from the undersecretary Brusasca, you can see the “Petrarca”’s audience being full of people. The camera started to film (the footage is professionally impeccable) five groups, in which there was the Aretino group, that brought (out of the competition) “Il saluto della città” for foreigners guests: it’s the “Guido Monaco” Chorus, directed by M° Tommaso Stendardi, a real choral expert , and the city musical life lost a lot from his premature disappearance. You can see at the end of the footage a young Maestro, who would have become one of the “Polyphonic”’s myths in the coming years: Bogdan Babic, a deep and charismatic director of the Yugoslavian Chorus. But let’s take a step back and let’s start from the beginning of the Competition. 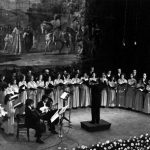 The 21st of May 1950 “Amici della Musica” invited the Polyphonic Choral of the roman “Saint Cecilia” Academy, directed by Bonaventura Somma, to held a concert in Arezzo, none of the members of the association realised the real extent of the event! A big crowd came to S. Francesco and everyone realised the great asset of the renaissance polyphony, that was to be explored and to be re-evaluated. 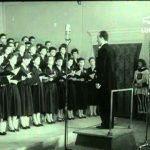 Mario Salmi – who as President of the “Petrarca” Academy was the godfather of “Amici della Musica”- didn’t want the concert of roman choristers to remain an isolated event: hence the idea to establish a National Polyphonic Competition, that was held for the first time during the September 1952. The competition was the classical “rock thrown into a pond”: the right idea at the right time. 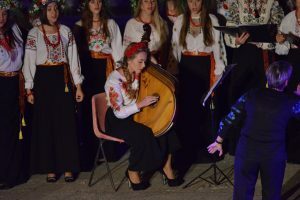 The idea was kindly approved from the Ministry of the Public Education and immediately translated into reality: few people knew that in our Country was missing a polyphonic tradition due to the big development that the melodrama have had during ‘800, creating unquestionable masterpieces and a great tradition, but downgrading any other musical genre. 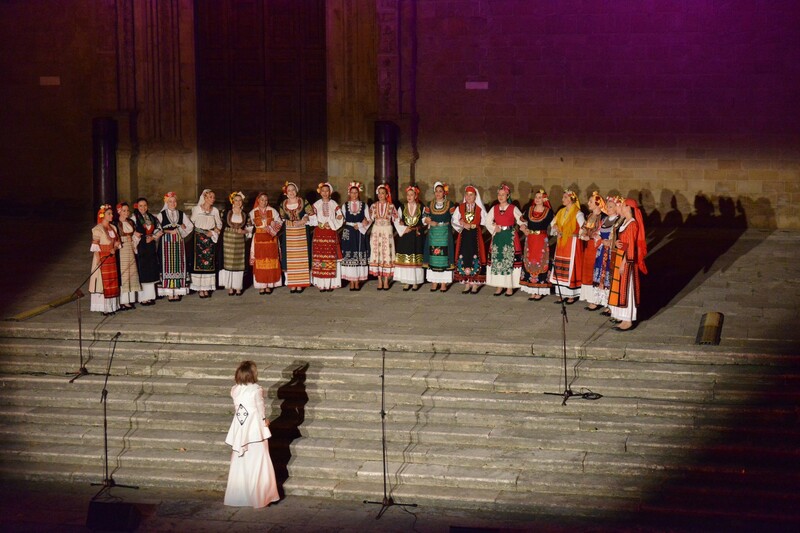 From that moment, in Arezzo, the “Polyphonic” has gradually grown until to impose world assizes of the Polyphony setting itself as a leader in the so called global village, because the path traced in the Guido’s city has become the highway that led to the organisation of similar initiatives in all over Europe, from Gorizia to Debrecen, from Tours to Toulouse. From the first edition of 1953, the Polyphonic’s vessel sailed with the wind in its stern and the moral up to the stars. The first years saw the settling of a winning formula: you just have to see the qualified national and foreign press of those years, from Giulio Confalonieri’s “Epoca” to Guido Pannain’s “Il Tempo”. Important personalities were enthusiastic about the Polyphonic: famous is a Venturino Venturi’s sketch for the readers of the Aretino “Giornale del Mattino” (but where is it now? ); nor we can talk about the visit of the Polyphonic by Amanuele Bondeville, director of the Paris Opera. 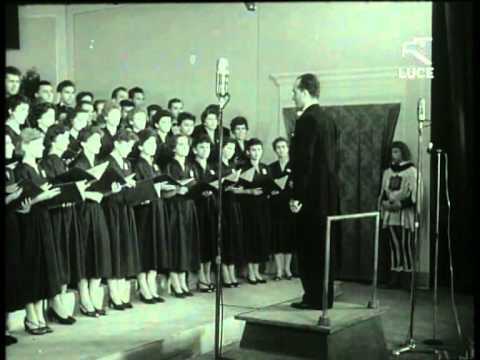 In 1958 the BBC created an English and Welsh program, and the New York television made a service that was seen in all the U.S.A. Lebrecht Klohs, distinguished Swiss juror, organized in Lübeck an international meeting of choral societies inviting the “Guido Monaco” Choral Society, while César Geoffray organized the Singing Olympics in Paris in 1956, on the wake of the Aretino Polyphonic. In 1959 began the taste for that that who write (in “La Nazione”) has baptized “cornice” (= frame), the collateral demonstration (often were more than one): Gwynn William directed, during the bicentennial of Haendel, pages of the Messia, enthusiastically with the Hallelujah. Luigi Colacicchi declared: «The Polyphonic is a means, not an end: the means to let knowing and spreading the major number of copies of Polyphonic Music». They looked carefully to the school world: from the 1955 it was possible to see the distance between school and music (the choral one in particular): the Ministry, sensitized, answered with an interesting experiment, that had a decent success: it was founded the 1st triennial course of choral training for teachers of primary schools in Serravalle, Bibbiena. In those years Arezzo lived a magnificent musical season, also thanks to the presence of the piano interpretation and specialization course by Benedetti Michelangeli: in 1960 Michelangeli opened the course to the polyphonic authorities. But the 1960 is famous in the annuals of the Polyphonic for the first execution in Italy of the “Missa Brevi” of B. Britten, and the director Colacicchi (it is nice to remember that used to sit at the organ the lamented Don Athos Bernardini). The success was massive and Britten thanked Colacicchi for his splendid work and for the so excellently execution. In 1962, as we have already said, for the decennial of the competition, came to Arezzo with Amintore Fanfani (Prime Minister), Antonio Segni (President of the Republic). 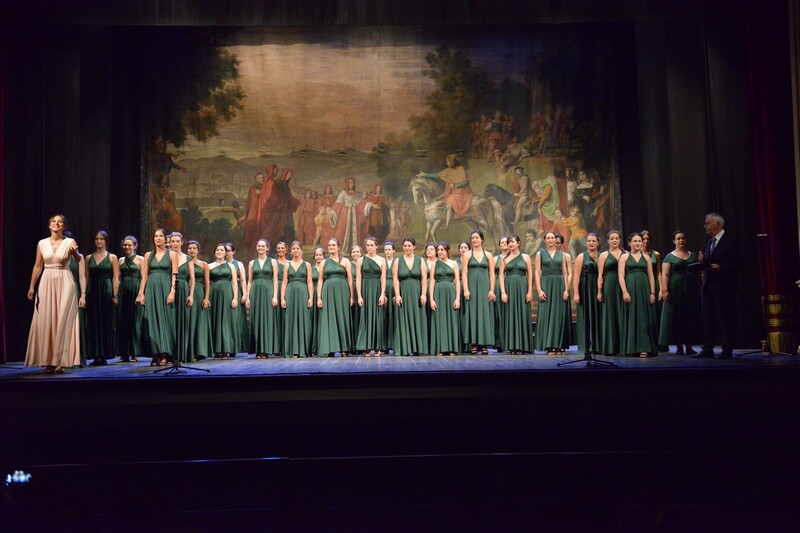 It was a memorable edition: la “cornice” saw a concert directed by Nino Antonellini (Roman Polyphonic Choral) and a performance by the Collegium Musicum Italicum (director Renato Fasano). 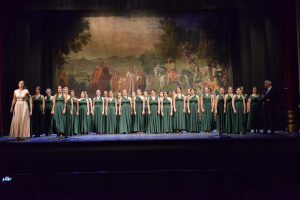 In the “misto” won the American Chorus from Arkansas, but a nice place was reached by “Tartini” from Trieste, starting the positive trend of Italian Chorus, never denied even if with its ups and downs. Giovanni XXXIII said during the UNESCO congress, thinking about the Polyphonic of Arezzo: «music makes people humble and generous, bounding them not temporary, but giving them the great idea of brotherhood». In 1985 the baton passed from “Amici della Musica” to the Foundation “Guido d’Arezzo”  which, keeping the beauty of an exemplar vocal-instrumental demonstration of the best European and World professionalism, managed to make musical activities of high level that include the research, the organization of conferences, the publication of the magazine “Polifonie” (one of the very few that, publishing every article also in English, reaches immediately the international audience), the management of musical series and the organization of the archive, financed by the Region that also supports the didactic activity for the formation of chorus directors. The Foundation, even though some financial difficulties, managed to handle the huge moral and artistic heritage passed down from “Amici della Musica”, even honoring the tradition of “cornici”: from the memorable concert of Boris Bloch in S. Fancesco (organizers really hoped to bring to Arezzo Benedetti Michelangeli) to the first international “Passio Iesu Christi secundum Ioannem” of Paolo Aretino in the Polyphonic dedicated to him, to the organization of round tables and conferences , to the management of the advanced school for choir directors. In 2002, on the occasion of the 50th anniversary of the competition, was held an extraordinary event. Luisi invited Roberto Gabbiani, who was recently nominated as director of the Chorus of the Saint Cecilia’s Academy, to have the “cornice” concert: Gabbiani agreed enthusiastically, and he produced an awesome palestrinian program, which obtained a more than deserved success in San Francesco. It was an emblematic case because nor Luisi nor others realised that the Roman Chorus started, fifty years before, the Polyphonic and that it was closed an almost secular ring: happened to who write in “La Nazione” to describe the singular circumstance. Sure it is that every superintendent has left his mark: the strongest was probably made by Francesco Luisi, thanks to him we have the “Guidoneum” project. In conclusion, we don’t know exactly where Guido was born: maybe in Arezzo, perhaps in Pomposa or in Talla, but this doesn’t matter: it is known all over the world as Guido from Arezzo and the city has fully revealed itself capable of a name that is way more known in the world than Piero della Francesca! Hans Gillesberger is considered one of the major chorus directors of the second half of the last century. He studied case law and sacred music in Innsbruk and in Vienna and he directed the “Vienna Boys’ Choir” from 1942 to 1945, to move on the direction of the Chorus of the State Opera of Vienna. In 1961 he was hired to teach at the Wiener Musikhochschule and in 1965 he was assumed at the Wiener Sangerknaben artistic direction. He left precious incisions as baseline of Bach’s works, of the Viennese Classicism (Haydn and Mozart) and the Middle-Europe Romanticism (Schubert, Liz and Bruckner). 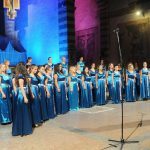 Since 1952, the Association “Amici della Musica” of Arezzo, started the International Polyphonic Competition and, from 1974, started the International Competition of Composition. The 25th of August 1983 was legally established the Foundation “Guido d’Arezzo” on the joint initiative taken by the Tuscany Region, by the Municipality and the Province of Arezzo and by the Association “Amici della Musica” of Arezzo. With the decree made the 25th of July 1984, by the President of the Tuscany Regional Council it became a private juridical personality. The Foundation started his own activity in 1985, connecting to the previous activity and starting new cultural initiatives related to the International Chorality. 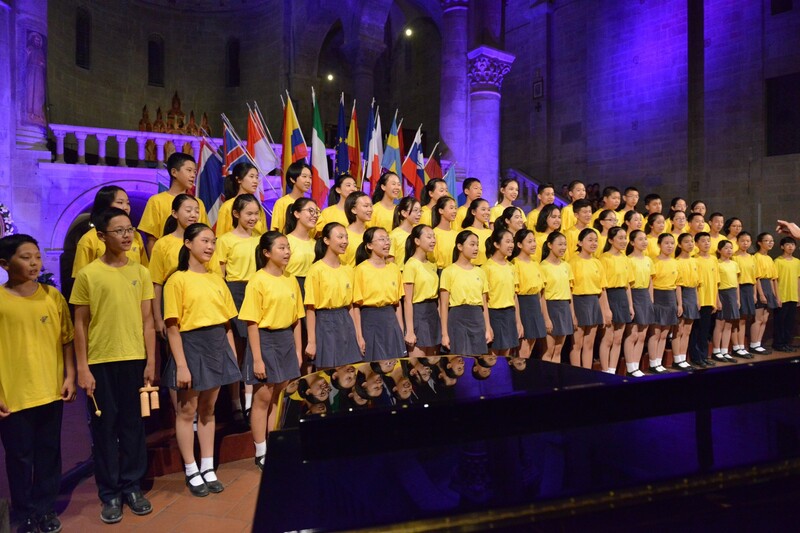 Next to it, as its supplementary and interactive corollary, it is held the annual International Competition of Composition “Guido d’Arezzo”. Its importance come from the incentive for today compositors for the enrichment and for the qualification of choral registers into the contemporary music. In this way the Foundation reached more than two thousand works of compositors from all over the world. Taking a cue from celebrations for the Millennial “Guido d’Arezzo”, celebrated by a National Committee established by the Ministry of the Goods and the Cultural Activities, from the 2000 the Foundation “Guido d’Arezzo” has instituted a Guidoniani Studies Centre to which activities of research, of editorial, of meeting and cultural activities are related. The International Polyphonic Competition “Guido d’Arezzo” enjoys since his origins of the High Patronage and currently of the Allegiance of the Presidency of the Republic with medal of representation.